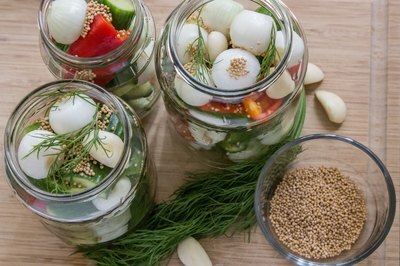 Pickling has been a popular way to preserve foods for thousands of years, dating back as early as the third century B.C. in China. 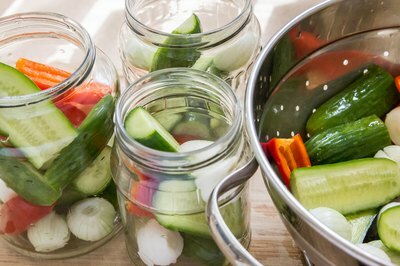 Fresh-pack, or heat-processed, pickling can not only make pickles from cucumbers as described in this article, but also can preserve a variety of other vegetables, such as peppers, beets and green beans, and even fruits like peaches and pears. The process is the same, though the spices you use will differ according to taste and what kind of vegetable or fruit you are pickling. 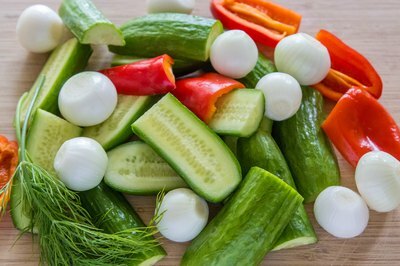 Another option is to pickle mixed chopped vegetables to create relish, such as combinations of red and green peppers with either onion or cucumber. Choose vegetables that are ripe and in excellent condition, with no blemishes. Wash them thoroughly. Chop or trim your vegetables to size, if necessary. Many vegetables, including cucumbers and beets, are pickled whole. However, if you're working with large vegetables such as peppers, you can cut them into quarters. Green tomatoes are usually sliced, yellow or green beans can be cut to a consistent length of 2 to 4 inches; asparagus spears should be trimmed to fit in your jar lengthwise. Create a brine solution by combining 1/3 cup salt in 1/2 gallon water in a large glass bowl. Make sure the vegetables are fully covered and soak them overnight. Drain the vegetables and pack them into 1-quart glass jars. Divide the mustard seed, dill and garlic evenly and place them in the jars. This spice combination creates a standard dill pickle flavor; you can adjust or change the spice ingredients for different vegetables and recipes. Combine the vinegar, salt, sugar and water in a medium pot. Bring the mixture to a boil. Pour it into the jars, leaving 1/2 inch of space at the top. Put the lids on the jars. Bring a large pot of water almost to boiling. There should be enough water in the pot to cover about 3/4 of the way up the jars. Place the jars carefully in the pot, then add very hot tap water to cover the jars with about 1 inch of water. Cover the pot and bring the water to a boil. Let it boil gently for 20 minutes. Check the water level to make sure the jars remain covered; add more water if necessary. Remove the jars from the boiling water and set them on a rack to cool thoroughly, with several inches of space between them.